This fairly simple looking document was what started my journey into understanding my grandfather more and his role in the Polish Army. I kept looking at the photo for some mysterious clue as to what he had done in the army. I focused in on the medal (its not a medal actually but at the time I thought it was!). It was focusing on that and finding out what it was and how it was earned that lead to this 100 page website being built! First of all we notice the number on the photo, 23781. 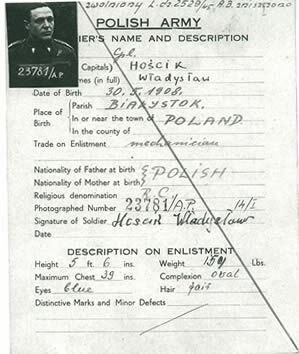 When the photo's were taken in the Polish army, they needed a way of matching photo's with soldiers and military records and so all photo's were numbered. The photographer would write down the soldiers name and unit and thus once the photos were developed they could be matched against the soldiers records. In the above case, you can see the number 23781 is also on the record card. This also ensured that for disciplinary purposes, body identification as well as the handing out of medals etc, that the correct soldier could be identified. The A.P on the photo stands for "Armia Polska". The writing at the top of the ID document says he was discharged (zwolniony) L.(?).dz. (ienny) 2529/45 (this is a daily order reference number). A cross check with the Daily Orders" should confirm that the person was indeed discharged from the army on that date. A.B. zniszczono stands for "A.B. destroyed". The AB destruction refers to Akta Bojowe - (The section that maintained fighting records) - fighting records were destroyed when soldiers were discharged. The primary reason for record destruction was to minimise paperwork and maintain secrecy. However, there was another reason for record destruction that is very interesting. Remembering that when the Russians invaded Poland they identified Polish officers and singled them out for execution at Katyn (some were not caught because they successfully concealed the fact they were officers) and that the Russians also deported Polish soldiers who had fought in World War 1 against the Russians, it is now no surprise the records were destroyed. You see, after World War 2, the Russians were given control over Poland ensuring that Poland remained Communist. Having just endured deportation, Siberia, evacuation out of the Soviet Union and then a short stay in the Middle East, it is no wonder that the Polish army adopted the policy of destroying fighting records. It seemed like a wise decision at the time. In the photo, the "medal" being worn is a "Znak Spadochronowy" a depiction of a swooping eagle (thus the website name!). It was awarded to those completing a course in parachuting at Largo House in Upper Largo and also at RAF Ringway. Once I found out the name of this badge it set me on a course investigating the Parachute Brigade, who they were, where they were formed, how they trained etc. This is in turn told me so much about my grandfathers journey out of Poland in 1939, through Siberia, the Middle East and onwards to the UK.